Farlin Baby Gloves keep your new-born baby's hands warm and comfortable while allowing free movement.. Whether they're hopping through puddles or bouncing to the bus stop, your toddler will love venturin.. Whether they're hopping through puddles or bouncing to the bus stop, your toddler will lov..
Whimsical umbrella coordinates with zoo raincoatStandard child-sized plastic handle100% Poly.. The Safety 1st Quiet Night bed rail fits all bed types and sizes thanks to its easy-to-tie straps.&n.. This Chicco Baby Comfort Digital Electronic Scale features an ergonomically designed and compact sha.. The Chicco First Steps Safety Harness allows you to help your baby take its first steps and keep him.. Sunglasses Chicco, is made of soft and pliable non-toxic - allergenic materials resistant to blows, .. 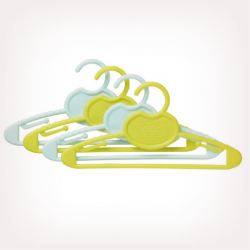 Very convenient, these 4 plastic cloth-hangers are the ideal accessories to store your child's cloth..